There are various opinions about the role of e-commerce has had on the brick and mortar store and decline of in-store shoppers. Some articles argue e-commerce is the main contributor to store closings today. 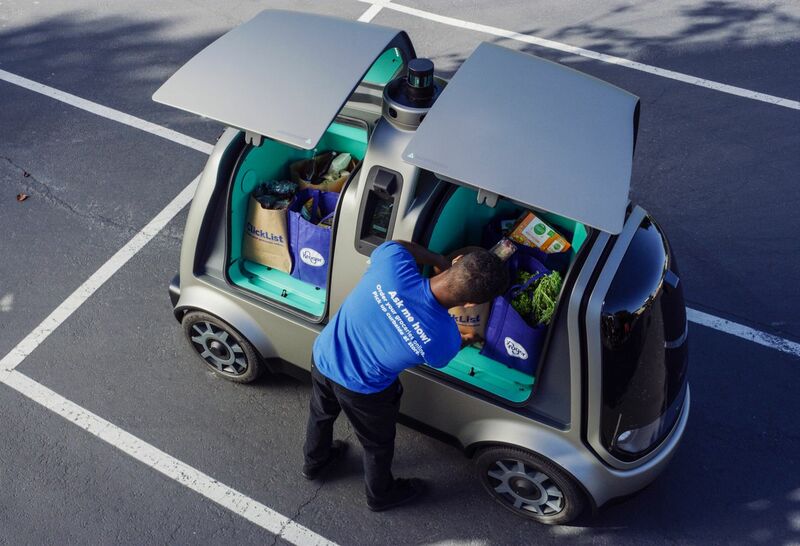 Further, as technology becomes more advanced and delivery services more efficient (including the adoption of AVs for delivery), the retail apocalypse is definitely approaching. However, other emerging articles are erring on the side that while the phrase ‘retail apocalypse’ makes for an eye-catching headliner, it might not be telling the whole story. If physical stores are actually dying, some argue, why are stores like Dollar General, Ulta Beauty, and Nordstrom Rack still announcing locations of additional stores? Rather than placing all the blame on Amazon for this new phase of retail, an article published by Bloomberg states that the US was bound to see a shift towards smaller retail footprints because we overbuilt retail space in the 1980s and 90s. The author also assumes that even without the rapid integration of e-commerce, consumer behavior today-particularly of Millennials would still prefer “the experience factor” of shopping. Different from past generations, it is now more important than ever for stores to be “unusual and delightful.” They need to create true destinations for people to enjoy. Perhaps retail isn’t dead altogether, but boring retail is. Another recent article published in The New Republic also argues e-commerce isn’t the only driving factor of a shifting retail market. The writer postulates that many stores closures and bankruptcies can actually be attributed to an even greater threat… debt, which explains why profitable stores such as Toys ‘R’ Us had to close their doors earlier this year. This article states that in reality, e-commerce might have only played a minimal role in the company’s demise, while the larger issue is that the company acquired an astounding $5 billion debt with interest payments of $400 million per year after it was bought by a private equity firm in 2006. Whether you agree or disagree with the retail apocalypse and/or the driving factors of a shift in retail, Forbes writer Steve Dennis puts it best, “Who cares?” Yes, while the causes and trends do matter, they only matter to an extent. The impacts of shifts in retail are troubling for communities, regardless of the causes. The one thing that we should all focus on and know for a fact, is that retail is changing. Is your community ready? How do you see it adapting towards the future of retail space? Amazon has been subject to criticism over the years for not paying sales taxes. Initially, Amazon and other retailers paid taxes in states where they had a physical presence. By 2017, Amazon began collecting sales taxes for all states that levy such taxes (as we reported here), though the retail giant still does not collect taxes sold by third parties (except in Washington and Pennsylvania.) 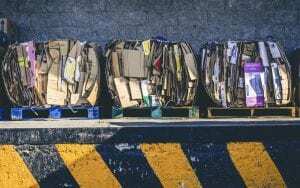 As Ben Casselman reports in the New York Times, collections at the local level are problematic. This raises important considerations from a local budgeting perspective. Cities are losing property tax revenue and local sales tax revenue as retailers shutter because of losing out to e-commerce like Amazon. Even worse, the lost local sales tax revenue is not being replaced as residents purchase goods online instead of at brick and mortar stores. Collecting local tax revenue is complicated – in 37 states, local governments can levy their own taxes. But collecting and remitting these taxes is not negotiated as part of the deals between the states and Amazon. A recent report by the Institute of Taxation and Economic Policy outlines some of the challenges. It is important for cities to realize the stakes and work with states and e-commerce to collect taxes. As Casselman writes: “(the issue) is less the fault of Amazon than of state tax systems that don’t require, and in some cases don’t allow, online retailers to collect local taxes.” It’s easy to understand why large retailers may not want to negotiate with each of the hundreds of local jurisdictions – but states can pass legislation or negotiate on behalf of the local jurisdictions within their state. That’s particularly important in states that don’t require collection of taxes unless the business has a local presence. Amazon not fulfilling their end of cities’ investments? A recent study published by the Economic Policy Institute (EPI) might have communities rethinking the costs and benefits of investing in Amazon warehouses. The report announced that US state and local governments have offered Amazon a total of over $1 billion in tax revenue to lure Amazon warehouses to their communities. Amazon has expanded their operation from 10 warehousing centers in 2000 to approximately 100 centers across the nation today. Why are cities investing so heavily in Amazon locations? Warehouses can employ anywhere from hundreds to thousands of people, which is fairly enticing for cities that have high rates of unemployment or lack a diverse economic base. Not to mention the attractive contributions that Amazon provides to communities where their employees live. But, the new EPI’s report argues that the job growth generated by Amazon warehouses is merely an exaggerated perception. Many cities may notice the percentage of warehousing sector employment increase (30%), but Amazon warehouses are not a silver bullet to significantly boost the overall employment rate. In fact, the report discovered that in some counties the total employment rate had actually decreased since Amazon warehouses opened. The release of the study comes at an interesting time. Last fall, Amazon announced their search for a second headquarters (HQ2). Over 200 cities applied for the bid. The new headquarters was estimated to generate over 50,000 jobs and add $5 billion to the local economy. Cities offered amazing and enticing planning strategies to competitively attract Amazon to select their proposal; many offered millions of dollars in tax incentives, promises to invest in rapid transportation modes, and some even offered to de-annex land for Amazon, and the list goes on. But latest EPI report raises questions about these incentives and enticements; it joins a small but growing chorus of people who expressed concerns about offering Amazon deals that may be too good to be true. The EPI Report urges local communities to slow their roll on handing out tax incentives to Amazon and to stop looking for such short-term solutions. Their advice to cities? Focus on long-term strategies and more traditional investments to spur economic development—specifically, invest in efficient transportation and quality public education. 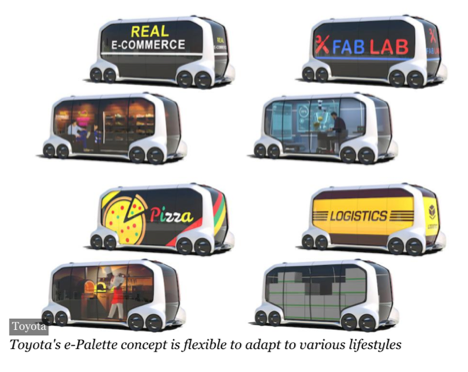 Akio Toyoda, President and Member of the Board of Directors for the Toyota Motor Corporation recently announced the e-Palette; a fully electrical autonomous vehicle (AV) that can be used for just about anything including being an at-your-door retail “store”. 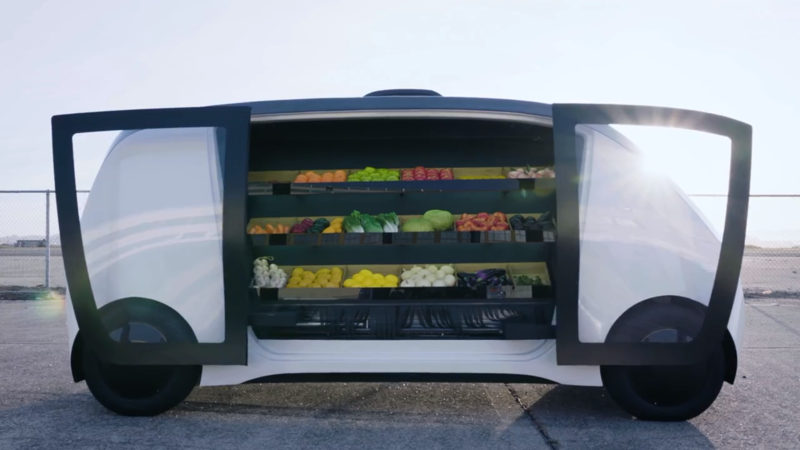 Toyoda states the e-Palette will not be any “ordinary” electrical AV—it will extend beyond the mobility of people and will fill a societal need to mobilize services and commerce. The e-Palette will be revolutionary in the retail market because not only will it deliver a customer’s order, but potentially a range of options – truly bringing the store to you. Imagine ordering a pair of shoes and having multiple pairs of those shoes in a variety of sizes arrive at your door for you to try on. There will be no driver or need to travel your local centers of commerce. While this may be unimaginable today, it might very likely be the next generation’s retail experience. Toyota, along with partners like Amazon, Uber and Pizza Hut hope to launch the e-Palette by 2020. The e-Palette has the potential to bring the convenience of retail to an entirely new level and it could have positive impacts such as reducing the number of single-occupancy trips per day and decreasing vehicle miles traveled per person. As people drive less, motor vehicle lanes could be reallocated to additional sidewalk space for pedestrians or to increase areas for curb access. But the e-Palette could have negative implications as well, such as the deactivation of downtowns, increased store closings, increased rates of social isolation and disengagement from the larger community among residents. In response to these concerns, what are critical strategies cities can plan for to incentivize active downtowns, retail centers, or plazas? Additionally, the e-Palette will inevitably require new tax policy and mobile-retail regulations in general. How will the e-Palette concept be integrated into the budgetary needs of a city? If you are interested in learning more about thee-Palette, you can watch the press conference here. Amazon is going to start collecting sales tax in all US states that collect sales tax on products it sells. Roughly half of all goods sold on Amazon are sold directly by Amazon (and something like half of e-commerce goes through Amazon, so this yields about ¼ of online sales), so this will have some seriously positive impacts for state and local governments across the nation. One of the largest complaints that brick & mortar retailers have had for years is that e-commerce retailers like Amazon have an unfair price advantage because they were not charging sales tax. It is reported that “This tax loophole also means states are missing out on an estimated $23 billion annually.” That is a big hole, and the move by Amazon is going to slowly plug that hole and start to level the playing field. As Amazon moves to same/next day delivery they have needed more distribution centers, thus making the sale tax dodge harder and harder for the online giant. The move by Amazon is a foreshadowing of what is to become of online retail and what it means for state and local governments. So while the demise of big box retail seems eminent, the revenue projections may get rosier for governments that are dependent on sales taxes. A series of articles together paint a dire picture for traditional brick and mortar retail. Overall, the structure of retail is changing – online sales are growing, stores are becoming showcases for sales that will happen on mobile devices, and warehouses are continuing to boom. E-Commerce is continuing its influence and increased its rate of growth from $30 billion per year from 2010-2014 to $40 billion per year in the last three years. This has led to a disappointing jobs report in March with retail losing nearly 35,000 jobs in that month alone. This is part of a larger trend of job losses and store closing. The US currently has more than six times the amount of retail space per capita than Europe and that historic trend is starting to feel like a bubble. 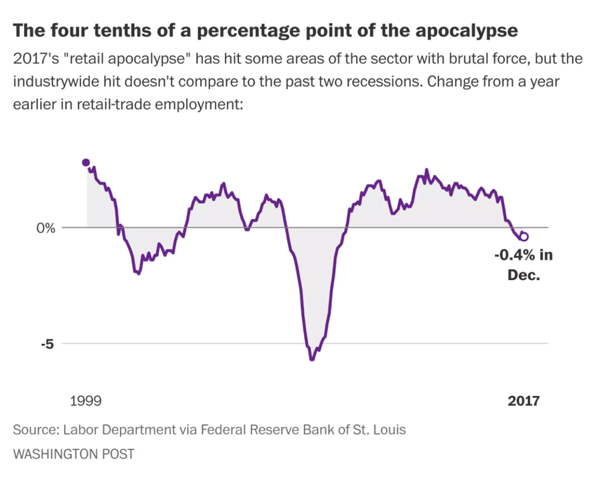 Since October, the US has sees a loss of 89,000 jobs in the retail – more than all of the employees in the US coal industry that was the poster child of economic hardship during the presidential campaign. All of this, coupled with a booming economy, seems to suggest that we are seeing a categorical shift in retail and not a momentary blip. Brick and mortar stores will continue to close – and this will continue to create issues for land use, urban activity, tax revenue, and labor. Walmart seems intent on not losing out to Amazon and is investing heavily in E-Commerce to keep themselves competitive. The WSJ article states that while brick-and-mortar sales are slowly rising, online sales have skyrocketed up 16% over the last quarter (and that quarter was a 21% rise from the quarter before). In a separate article from SupplyChain247, Walmart’s CEO talks about the future of retail. In short, in his view we will all be shopping online, will want to know the sourcing of our products and will want to make sure social and environmental sustainability is being considered. 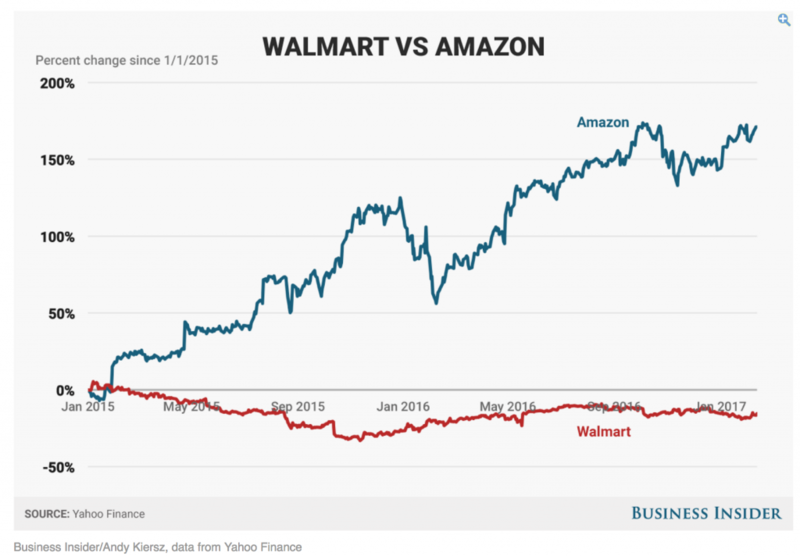 Of note in the article as well was the graph below, showing the change in share price of Walmart vs. Amazon. The picture is even grimmer if you look back 10 years. Walmart stock has risen 48% during that time versus Amazon’s 2,024% increase. 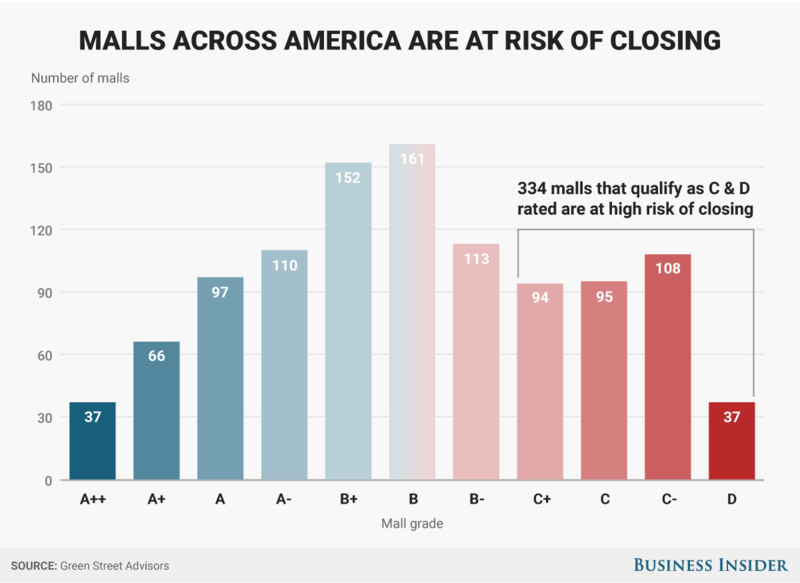 Macy’s and Sears are closing stores throughout the country (250 stores in total) as trends continue to push against traditional bricks-and-mortar retailers. While nobody suggests bricks-and-mortar will completely disappear, this is yet another step in the continuing shift away from traditional retail. Previously considered anchor tenants that drove (almost literally) shoppers to large malls, the retail landscape has shifted towards smaller, more nimble, and often e-commerce linked retail. This will have large implications on the amount of retail in the country, its distribution, and the size of parcels/spaces. 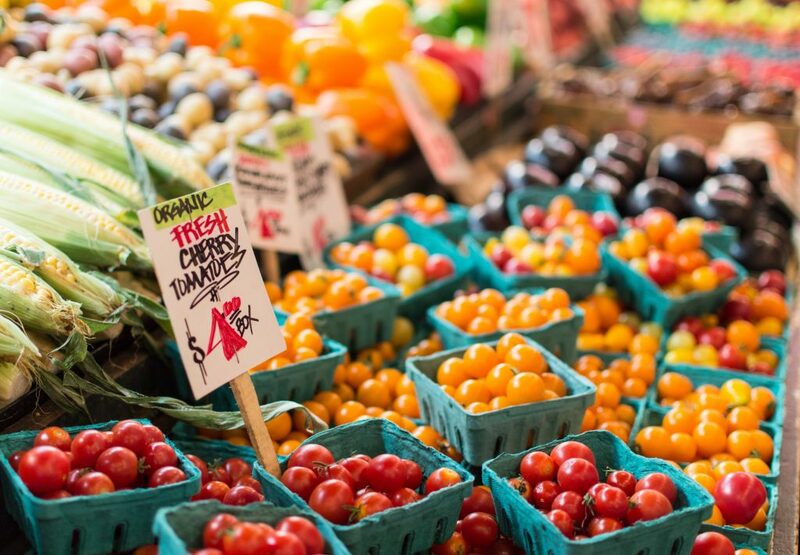 From recent discussions we have been having with industry experts, it seems that a quality sort is just beginning, where size and location of retail may start to give way to quality of experience and place. 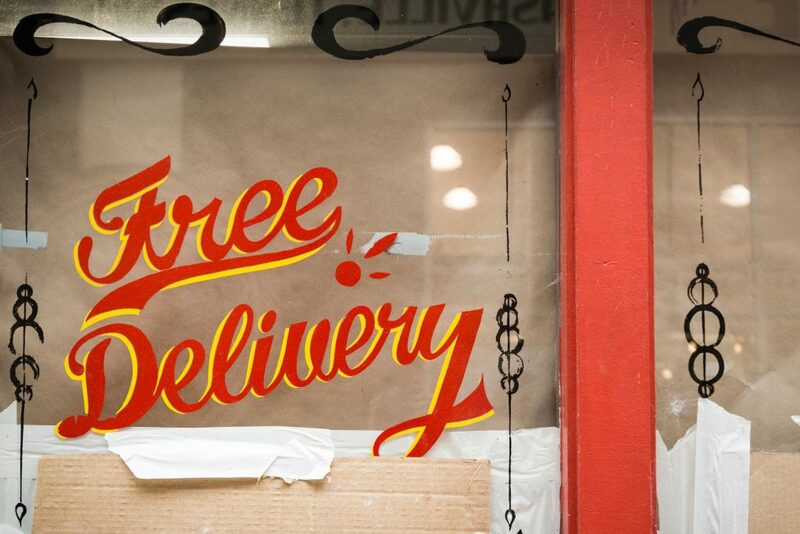 As online shopping continues to become commonplace, so do the number of delivery trucks delivering those goods directly to consumers, rather than centralized stores. 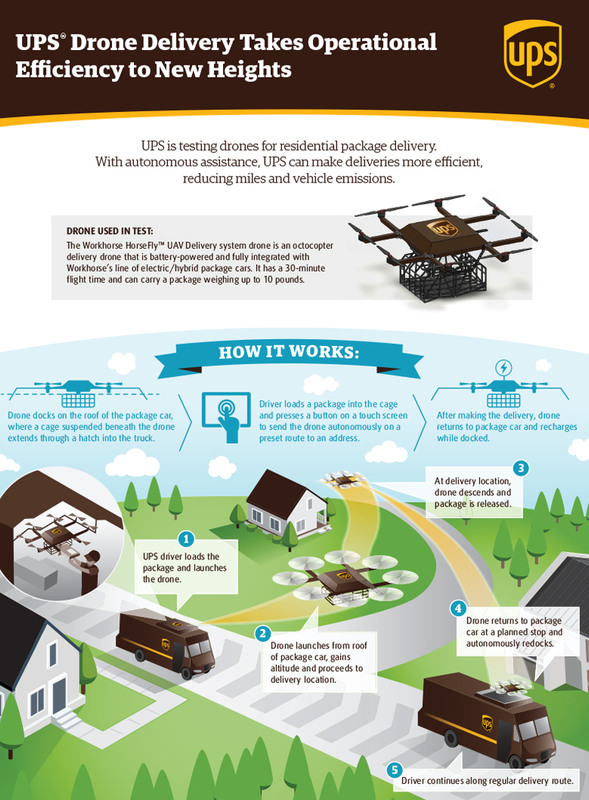 While there clearly is convenience in this approach, the increase in delivery vehicles on our streets is significant as 10-30% of the time the same package must be delivered more than once because no one is home and many goods are also returned this same way. The space of our streets is limited – can space-efficient forms of transportation such as bicycles be designed into the center of urban delivery systems? And at the other end of the spectrum, Amazon is experimenting with personnel-free shopping in urban areas where goods can be purchased without the help of a cashier at all – whether human or self-service machine. This type of technology may have dual effects on the future of cities – there may be lower need for space for employee parking (there are none), but what might it mean for cities to lose part of its entry-level workforce option? This article talks about how the combination of AV’s and E-Commerce will create havoc for the retail industry. More of our shopping will go online while bricks and mortar stores will start to act more like distribution warehouses as AV’s are sent to run errands and pick up things we need. This will have large implications for how retail works in urban areas – where it is located, how much of it we need built, and a shift (already occurring) from retail being based on a need to retail being proposed as an experience. Large implications for activity centers throughout urbanized areas as many of them have retail as a core vitality generator.